Five topics related to the general pharmacology of opioids are reviewed in the first part of this chapter: (1) opioid receptors; (2) functions of opioids at receptors; (3) consequences of repeated administration and withdrawal of opioids; (4) the affinity, intrinsic activity, and dissociation of opioids from receptors; and (5) general characteristics of abused opioids. These topics are followed by a detailed review of the general and applied pharmacology of buprenorphine. Opioid receptors are molecules on the surfaces of cells to which opioid compounds attach and through which they exert their effects. Different types of opioid receptors are present in the brain. The receptor most relevant to opioid abuse and treatment is the mu receptor. It is through activation of the mu receptor that opioids exert their analgesic, euphorigenic, and addictive effects. The roles of other types of opioid receptors in the brain (that is, non‐mu opioid receptors) in the addictive process are not well defined. Opioids can interact with receptors in different ways. For purposes of this discussion, three types of drug/receptor interactions are described: agonists (or full agonists), antagonists, and partial agonists. Drugs that activate receptors in the brain are termed agonists. Agonists bind to receptors and turn them on—they produce an effect in the organism. Full mu opioid agonists activate mu receptors. Increasing doses of full agonists produce increasing effects until a maximum effect is reached or the receptor is fully activated. Opioids with the greatest abuse potential are full agonists (e.g., morphine, heroin, methadone, oxycodone, hydromorphone). Antagonists also bind to opioid receptors, but instead of activating receptors, they effectively block them. Antagonists do not activate receptors, and they prevent receptors from being activated by agonist compounds. An antagonist is like a key that fits in a lock but does not open it and prevents another key from being inserted to open the lock. Examples of opioid antagonists are naltrexone and naloxone. Partial agonists possess some of the properties of both antagonists and full agonists. Partial agonists bind to receptors and activate them, but not to the same degree as do full agonists. At lower doses and in individuals who are not dependent on opioids, full agonists and partial agonists produce effects that are indistinguishable. As doses are increased, both full and partial agonists produce increasing effects. 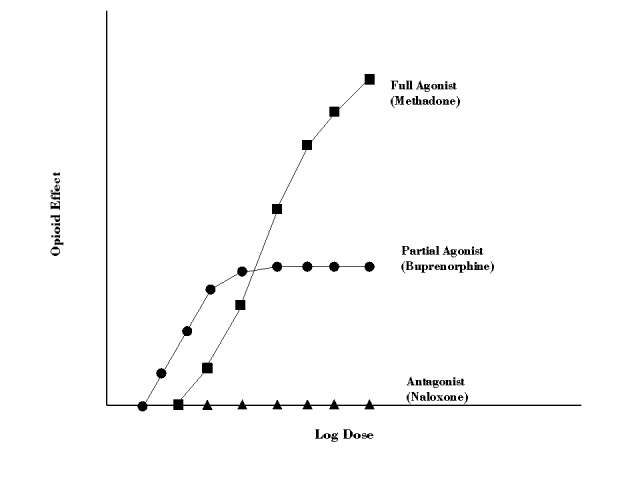 At a certain point, however, as illustrated in figure 2-1, the increasing effects of partial agonists reach maximum levels and do not increase further, even if doses continue to rise—the ceiling effect. The figure represents any effect mediated by mu opioid receptors (e.g., analgesia, euphoria, respiratory depression). As higher doses are reached, partial agonists can act like antagonists—occupying receptors but not activating them (or only partially activating them), while at the same time displacing or blocking full agonists from receptors. Buprenorphine is an example of a mu opioid partial agonist, and its properties as such are discussed in detail below. The repeated administration of a mu opioid agonist results in tolerance and dose‐dependent physical dependence. Tolerance is characterized by a decreased subjective and objective response to the same amount of opioids used over time or by the need to keep increasing the amount used to achieve the desired effect. In the case of abuse or addiction, the desired effect typically is euphoria. Physical dependence is manifested as a characteristic set of withdrawal signs and symptoms in response to reduction, cessation, or loss of the active compound at receptors (withdrawal syndrome). Typical signs and symptoms of the opioid withdrawal syndrome include lacrimation, diarrhea, rhinorrhea, piloerection, yawning, cramps and aches, pupillary dilation, and sweating. Not all of these signs and symptoms are necessarily present in any single individual experiencing the opioid withdrawal syndrome. Withdrawal, characterized by marked distress, may include drug craving and drug seeking and is frequently associated with relapse to drug use in a patient with opioid addiction. In an individual who otherwise is in good general health (e.g., with no history of significant cardiovascular disease), opioid withdrawal is not life threatening. Patients with cardiovascular disease or other severe conditions will need comanagement involving the appropriate specialist, as well as consultation with an addiction specialist. Two types of withdrawal are associated with mu opioid agonists: spontaneous withdrawal and precipitated withdrawal. Spontaneous withdrawal can occur when an individual who is physically dependent on mu agonist opioids (e.g., has been using opioids on a daily basis) suddenly discontinues that opioid use. It also can occur if an individual who is physically dependent markedly decreases his or her daily opioid use. In an individual who is physically dependent on heroin, spontaneous withdrawal usually begins 6–12 hours after the last dose and peaks in intensity 36–72 hours after the last use. The spontaneous withdrawal syndrome from heroin lasts approximately 5 days, although a milder, protracted withdrawal may last longer. Other short‐acting opioids, such as oxycodone and hydrocodone, have kinetic profiles that are similar to heroin, and the time course of spontaneous withdrawal for these agents should be similar to that documented for heroin. Opioids with longer half‐lives have a longer period before the onset of spontaneous withdrawal (e.g., 24–72 hours for methadone) and a longer period before peak withdrawal is experienced. Precipitated withdrawal also occurs in individuals who are physically dependent on mu agonist opioids. Precipitated withdrawal usually occurs when an individual physically dependent on opioids is administered an opioid antagonist. In an individual who is not physically dependent upon opioids, the acute administration of an antagonist typically produces no effects. In an individual who is physically dependent on opioids, however, an antagonist produces a syndrome of withdrawal that is qualitatively similar to that seen with spontaneous withdrawal (although the onset is faster and the syndrome is shorter, depending on the half‐life of the antagonist). One way to conceptualize precipitated withdrawal is that the antagonist displaces agonists from receptors, but because the antagonist does not activate the receptor, there is a net decrease in agonist effect, resulting in withdrawal. It is also possible for partial agonists to precipitate withdrawal. If an individual who is physically dependent on opioids receives an acute dose of a partial agonist, the partial agonist can displace the full agonist from the receptors yet not activate the receptors as much as the full agonist had. The net effect would be a decrease in agonist effect and a precipitated withdrawal syndrome. Precipitated withdrawal with a partial agonist is more likely to occur in an individual who has a high level of physical dependence (e.g., high use of opioids each day), who takes the partial agonist soon after a dose of full agonist, and/or who takes a high dose of the partial agonist. These points, discussed in more detail below, are directly relevant to the initiation of buprenorphine treatment. The strength with which a drug binds to its receptor is termed its affinity. The degree to which a drug activates its receptors is termed its intrinsic activity. Affinity for a receptor and activation of the receptor are two different qualities of a drug. A drug can have high affinity for a receptor but not activate the receptor (e.g., an antagonist). Mu opioid agonists, partial agonists, and antagonists can vary in their affinity. In addition to variations in affinity and intrinsic activity, drugs also vary in their rate of dissociation from receptors. Dissociation is a measure of the disengagement or uncoupling of the drug from the receptor. Dissociation is not the same as affinity—a drug can have high affinity for a receptor (it is difficult to displace it from the receptor with another drug once the first drug is present), but it still dissociates or uncouples from the receptor with some regularity. Buprenorphine’s slow dissociation contributes to its long duration of action. The rate of onset of the pharmacological effects of a drug, and thereby its abuse potential, is determined by a number of factors. Important among these are the drug’s route of administration, its half‐life, and its lipophilicity (which determines how fast the drug reaches the brain). A faster route of drug administration (e.g., injection, smoking), a shorter half‐life, and a faster onset of action all are associated with a higher abuse potential of a drug. With all classes of drugs of abuse, it has been shown that the likelihood of abuse is related to the ease of administration, the cost of the drug, and how fast the user experiences the desired results after the drug’s administration. In this respect, heroin is highly abusable, as it currently is inexpensive; can be snorted, smoked, or injected; and produces a rapid euphorigenic response. Buprenorphine is a thebaine derivative that is legally classified as a narcotic. It is available in numerous countries for use as an analgesic. When used as an analgesic, buprenorphine is usually given by injection, via a sublingual tablet, or as a transdermal patch, and doses are relatively low (compared with doses used in the treatment of opioid addiction). The typical analgesic dose of buprenorphine is 0.3–0.6 mg (intramuscular or intravenous), and its analgesic effects last about 6 hours. Buprenorphine is a partial agonist that exerts significant actions at the mu opioid receptor. As reviewed in the previous section, however, its maximal opioid effects are less than that of full agonists, and reach a ceiling where higher doses do not result in increasing effect. Because it is a partial agonist, higher doses of buprenorphine can be given with fewer adverse effects (e.g., respiratory depression) than are seen with higher doses of full agonist opioids. Past a certain point, dose increases of buprenorphine do not further increase the pharmacological effects of the drug but do increase its duration of withdrawal suppression and opioid blockade. At low doses, buprenorphine is many times more potent than morphine. Individuals who are not dependent on opioids but who are familiar with the effects of opioids experience a subjectively positive opioid effect when they receive an acute dose of buprenorphine. These subjective effects aid in maintaining compliance with buprenorphine dosing in patients who are addicted to opioids. Buprenorphine has high affinity for, but low intrinsic activity at, mu receptors. Buprenorphine displaces morphine, methadone, and other full opioid agonists from receptors. It also can block the effects of other opioids (Bickel et al. 1988b ; Rosen et al. 1994; Strain et al. 2002). Because of buprenorphine’s higher affinity for the mu receptor, full agonists cannot displace it and therefore will not exert an opioid effect on receptors already occupied by buprenorphine. This effect is dose related, as shown by Comer et al. (2001) in a study demonstrating that the 16‐mg dose of the sublingual buprenorphine‐alone tablet was more effective than the 8‐mg dose in blocking the reinforcing effects of heroin. Similarly, it is difficult for opioid antagonists (e.g., naloxone) to displace buprenorphine and precipitate withdrawal. Buprenorphine has a slow dissociation rate from the mu opioid receptor, which gives rise to its prolonged suppression of opioid withdrawal and blockade of exogenous opioids. This enables buprenorphine dosing to occur on a less frequent basis than full opioid agonists (Amass et al. 1994a ,b, 1998, 2000 2001). Buprenorphine can be given as infrequently as three times per week (Amass et al. 2001; Perez de los Cobos et al. 2000; Schottenfeld et al. 2000). Buprenorphine’s effectiveness as a medication for the treatment of opioid addiction on a daily or less‐than‐daily basis contrasts with its relatively short duration of action as an analgesic. Buprenorphine has poor gastrointestinal (GI) bioavailability (Brewster et al. 1981; Walter and Inturrisi 1995), and fair sublingual bioavailability. (See figure 2-2.) FDA‐approved formulations of the drug for treatment of opioid addiction are in the form of sublingual tablets that are held under the tongue and absorbed through the sublingual mucosa. Studies of sublingually administered buprenorphine have employed either an alcohol‐based solution or a tablet formulation of the drug. Confusion may result when reviewing the literature on the effectiveness of buprenorphine at various doses because most early trials and clinical studies of buprenorphine were performed with a sublingually administered liquid preparation, whereas the oral formulations marketed in the United States are sublingual tablets. Studies have shown that the bioavailability of buprenorphine in sublingual tablet form is significantly less than via sublingual liquid solution—about 50–70 percent that of the liquid form (Nath et al. 1999; Schuh and Johanson 1999), so the dosages of buprenorphine sublingual tablets must be significantly higher than those used in the liquid form to achieve the same therapeutic effect. Abuse of buprenorphine has been reported to occur via the sublingual and intranasal routes but primarily via diversion of sublingual tablets to the injection route. In a study from France (Obadia et al. 2001), sublingual, buprenorphine‐only tablets (Subutex®), marketed for the treatment of opioid addiction, were diverted to the injection route. Laboratory studies with inpatient subjects have examined the effects of buprenorphine relevant to abuse potential in two populations: (1) subjects who have a history of opioid abuse but are not physically dependent on opioids, and (2) subjects who are physically dependent on opioids. In nonphysically dependent opioid users, acute parenteral doses of buprenorphine produce typical mu agonist opioid effects (e.g., pupillary constriction, mild euphoria), suggesting that this population could abuse buprenorphine (Jasinski et al. 1978, 1989; Pickworth et al. 1993). Similar effects can occur in this population when buprenorphine is administered via other routes, including the sublingual route (Jasinski et al. 1989; Johnson et al. 1989; Walsh et al. 1994). Strain et al. (2000) recently reconfirmed the opioid‐like effects of sublingually administered buprenorphine in this population. These researchers further found that, in nondependent subjects, the addition of naloxone (in the buprenorphine/naloxone combination tablet) did not attentuate buprenorphine’s opioid effects via the sublingual route. The onset of effects via the sublingual route is slower than that seen with parenteral administration, suggesting that the abuse potential by this route is lower than via the parenteral route. The abuse potential of buprenorphine in individuals who are physically dependent on opioids varies as a function of three factors: (1) level of physical dependence, (2) time interval between administration of the full agonist and of buprenorphine, and (3) the dose of buprenorphine administered. Level of Physical Dependence. In individuals with a high level of physical dependence (e.g., those using substantial amounts of opioids on a daily basis), buprenorphine may precipitate withdrawal when taken during the time of opioid intoxication or receptor occupancy. The relationship between level of physical dependence and buprenorphine‐related precipitated withdrawal has been investigated primarily in subjects maintained on methadone. For example, patients maintained on 60 mg of methadone daily can experience precipitated withdrawal from acute doses of sublingual buprenorphine (Walsh et al. 1995). Conversely, in individuals with a low level of physical dependence (e.g., patients maintained on <30 mg per day of methadone), buprenorphine could produce opioid agonist effects, thus suggesting a potential for abuse. Time Interval. The abuse potential of buprenorphine in opioid‐dependent individuals also varies as a function of the time interval between the dose of agonist and the dose of buprenorphine. At relatively short time intervals (e.g., 2 hours after a dose of methadone), buprenorphine can precipitate withdrawal—even when the level of physical dependence is relatively low (Strain et al. 1995). At longer time intervals, it becomes more likely that buprenorphine will exhibit either no effects (i.e., similar to placebo [Strain et al. 1992]) or effects similar to opioid agonists. Acute Dose of Buprenorphine. Finally, the dose of buprenorphine administered also can influence its abuse potential. Low doses of injected buprenorphine (e.g., ≤2 mg) produce minimal effects in opioid‐dependent patients and are primarily identified as similar to placebo (Strain et al. 1992) although there has been at least one report of more precipitated abstinence (Banys et al. 1994). Higher doses can be identified as opioid agonist‐like, especially as the time interval since the dose of agonist increases (e.g., 24 or more hours) and if the individual has a lower level of physical dependence (e.g., 30 mg per day of methadone or the equivalent). Although buprenorphine can precipitate withdrawal under certain circumstances, it is worth noting that it does not usually produce severe precipitated withdrawal symptoms. Repeated administration of buprenorphine produces or maintains opioid physical dependence; however, because buprenorphine is a partial agonist, the level of physical dependence appears to be less than that produced by full agonists (Eissenberg et al. 1996). Furthermore, the withdrawal syndrome associated with buprenorphine discontinuation may be significantly milder in intensity, and the onset of withdrawal signs and symptoms slower, than that seen with full mu agonists (Eissenberg et al. 1997; Jasinski et al. 1978; Mello et al. 1982; San et al. 1992). The reason for the slower onset of withdrawal symptoms is not completely understood but is likely related to buprenorphine’s slow dissociation from the mu receptor. Gradual dose reduction of buprenorphine results in an even milder withdrawal syndrome. The primary side effects of buprenorphine are similar to other mu opioid agonists (e.g., nausea, vomiting, constipation), but the intensity of these side effects may be less than that produced by full agonist opioids. Because of buprenorphine’s poor GI bioavailability, swallowing the tablets will result in a milder effect compared with administering them sublingually. (By extrapolation, buprenorphine tablets are approximately one‐fifth as potent when swallowed versus when taken sublingually.) Buprenorphine’s ceiling effect also adds to its safety in accidental or intentional overdose. Preclinical studies suggest that high acute doses of buprenorphine (analogous to an overdose) produce no significant respiratory depression or other life‐threatening sequelae (e.g., circulatory collapse). Overdose of buprenorphine combined with other medications, however, may increase morbidity and mortality, as described further below. Available evidence in patients maintained on buprenorphine indicates no clinically significant disruption in cognitive and psychomotor performance (Walsh et al. 1994). Elevation in liver enzymes (AST and ALT) has been reported in individuals receiving buprenorphine (Lange et al. 1990; Petry et al. 2000). There also appears to be a possible association between intravenous buprenorphine misuse and liver toxicity (Berson et al. 2001). See Johnson et al. (2003b) for further details. Mild elevations in liver enzymes have been noted in patients with hepatitis who received long‐term buprenorphine dosing (Petry et al. 2000). There is limited clinical experience with buprenorphine maintenance in pregnant women who are addicted to opioids. The literature in this area is limited to case reports, prospective studies, and open‐labeled controlled studies; however, no randomized controlled studies have been reported (Johnson et al. 2003b ). See “Pregnant Women and Neonates” in chapter 5 for a detailed discussion of the available clinical and research evidence. variability in response to buprenorphine, precipitated withdrawal symptoms tend to be milder than those produced by antagonist‐precipitated withdrawal, and intervention is rarely required. In controlled studies in which buprenorphine was given to individuals who were physically dependent on opioids, the precipitated withdrawal syndrome was both mild in intensity and easily tolerated (Strain et al. 1995). However, at least one open‐label small‐sample trial of low‐dose buprenorphine caused a patient to experience pronounced, precipitated, and poorly tolerated withdrawal of severe intensity (Banys et al. 1994). The probability of precipitating a withdrawal syndrome is minimized by reducing the dose of mu agonist before buprenorphine treatment is initiated, by allowing a longer elapsed interval between last agonist dose and first buprenorphine dose, and by starting treatment with a lower buprenorphine dose. There have been case reports of deaths apparently associated with injections of buprenorphine combined with benzodiazepines and/or other central nervous system (CNS) depressants (e.g., alcohol) (Reynaud et al. 1998a ,b). Gaulier et al. (2000) reported a case of fatal overdose in which buprenorphine and its metabolites, as well as the metabolites of flunitrazepam, were very high at the time of death. Although it is not known if this is a pharmacodynamic interaction, Ibrahim et al. (2000) and Kilicarslan and Sellers (2000) suggest that, because of buprenorphine’s weak ability to inhibit the cytochrome P450 3A4 system, the effect is more likely pharmacodynamic. This interaction, however, underscores the importance for physicians to be cautious in prescribing buprenorphine in conjunction with benzodiazepines, as well as in prescribing buprenorphine to patients who are addicted to opioids and also are abusing or are addicted to benzodiazepines. It is prudent to assume that these cautions also should be applied to buprenorphine combined with other CNS depressants, including alcohol and barbiturates. Buprenorphine treatment should not be combined with opioid antagonists (e.g., naltrexone). It is common for individuals who are addicted to opioids to be concurrently dependent on alcohol. Although naltrexone may decrease the likelihood of relapse to drinking, patients maintained on opioids should not be given naltrexone to prevent alcohol relapse since the naltrexone can precipitate an opioid withdrawal syndrome in buprenorphine‐maintained patients. Thus, physicians should not prescribe naltrexone for patients being treated with buprenorphine for opioid addiction. For a continuously updated list of cytochrome P450 3A4 drug interactions, visit http://medicine​.iupui​.edu/flockhart/table.htm. Clinical situations may arise in which a full agonist may be required for patients who currently are being treated with buprenorphine, such as in the treatment of acute pain. Although this medication interaction has not been studied systematically, the pharmacological characteristics of buprenorphine suggest that it may be difficult to obtain adequate analgesia with full agonists in patients stabilized on maintenance buprenorphine. Data nonspecific to buprenorphine suggest that, in patients maintained chronically on methadone, the acute administration of full mu agonists for analgesia can be effective. If the necessity should arise for the use of a full mu agonist for pain relief in a patient maintained on buprenorphine, the buprenorphine should be discontinued until the pain can be controlled without the use of opioid pain medications. It must be recognized that treatment with full mu agonists for pain relief will produce increased opioid tolerance and a higher degree of physical dependence. See “Patients With Pain” in chapter 5 for a detailed discussion of the treatment of pain in patients maintained on buprenorphine. Buprenorphine can be used for either longterm maintenance or for medically supervised withdrawal (detoxification) from opioids. The preponderance of research evidence and clinical experience, however, indicates that opioid maintenance treatments have a much higher likelihood of long‐term success than do any forms of withdrawal treatment. In any event, the immediate goals in starting buprenorphine should be stabilization of the patient and abstinence from illicit opioids, rather than any arbitrary or predetermined schedule of withdrawal from the prescribed medication. methadone and levo‐alpha‐acetyl‐methadol (LAAM) (Johnson et al. 2000). Results from these studies suggest that buprenorphine in a dose range of 8–16 mg a day sublingually is as clinically effective as approximately 60 mg a day of oral methadone, although it is unlikely to be as effective as full therapeutic doses of methadone (e.g., 120 mg per day) in patients requiring higher levels of full agonist activity for effective treatment. A meta‐analysis comparing buprenorphine to methadone (Barnett et al. 2001) concluded that buprenorphine was more effective than 20–35 mg of methadone but did not have as robust an effect as 50–80 mg methadone—much the same effects as the individual studies have concluded. Buprenorphine’s partial mu agonist properties make it mildly reinforcing, thus encouraging patient compliance with regular administration. This is in contrast to medications such as naltrexone, which also blocks the effects of opioid agonists but lacks any agonist effects. Because a medication such as naltrexone is not reinforcing, adherence in therapeutic use is poor. Naltrexone also may increase the risk for overdose death in the event of relapse following its discontinuation. Although controlled clinical studies of the use of buprenorphine as an agent for treating opioid withdrawal (detoxification) are scarce, some clinical research on its use for this indication has been conducted (Parran et al. 1994). In general, buprenorphine has been used in three ways for withdrawal from opioids: long‐period withdrawal (>30 days), usually on an outpatient basis; moderate‐period withdrawal (>3 days but <30 days), again on an outpatient basis; and short‐period withdrawal (<3 days), which often has been conducted on an inpatient basis. The available evidence from buprenorphine and methadone research suggests that long‐period buprenorphine withdrawal probably would be more effective than moderate‐ or short‐period withdrawals but that all forms of withdrawal are less effective compared with ongoing opioid maintenance (Amass et al. 1994a ,b; Sees et al. 2000). Long‐Period Withdrawal. Although few data are available on the use of buprenorphine for gradual withdrawal over a period of months, the literature on opioid withdrawal can be used to guide recommendations in this regard. This literature suggests that using buprenorphine for gradual detoxification is more effective than its use for rapid detoxification in terms of patient compliance and relapse to opioid use. These findings are analogous to those seen with methadone which show that patients undergoing a 10‐week methadone dose reduction (i.e., 10 percent per week) had a higher rate of opioid‐positive urine samples than those receiving a 30‐week dose reduction (i.e., 3 percent per week) and asked for more schedule interruptions (Senay et al. 1977). Moderate‐Period Withdrawal. Few studies of withdrawal from illicit opioids have been conducted using buprenorphine for moderate periods (>3 days, but <30 days). Moderate‐period withdrawal using buprenorphine suppresses signs and symptoms of withdrawal, is tolerated by patients, and is safe. For example, a study comparing 10 days of buprenorphine versus clonidine for the inpatient treatment of opioid withdrawal found buprenorphine superior to clonidine in relieving withdrawal signs and symptoms (Nigam et al. 1993). Outcomes with moderate‐period withdrawal, however, are unlikely to be as positive as those seen with long‐period withdrawal (Amass et al. 1994a ,b). Reports have indicated that buprenorphine is well accepted by patients for short‐period withdrawal and that opioid withdrawal signs and symptoms are suppressed (DiPaula et al. 2002; Bickel et al. 1988a ). When compared with clonidine for the treatment of short‐period withdrawal, buprenorphine is better accepted by patients and more effective in relieving withdrawal symptoms (Cheskin et al. 1994). Long‐term outcomes from short‐period opioid withdrawal using buprenorphine have not been reported, however, and studies of other withdrawal modalities have shown that brief withdrawal periods do not produce measurable long‐term benefits (Simpson and Sells 1989); patients usually relapse to opioid use. There have been reports from several countries of abuse of buprenorphine by injection. Because of this buprenorphine abuse, a sublingual tablet form containing naloxone has been developed for the U.S. market to decrease the potential for abuse of the combination product via the injection route. Sublingual naloxone has relatively low bioavailability (Preston et al. 1990), while sublingual buprenorphine has good bioavailability. (Both naloxone and buprenorphine have poor GI bioavailability.) Thus, if a tablet containing buprenorphine plus naloxone is taken as directed—sublingually—the patient will experience a predominant buprenorphine effect. However, if an opioid‐dependent individual dissolves and injects the combination tablet, then the antagonistic effect of naloxone predominates because of its high parenteral bioavailability (Stoller et al. 2001). Under such circumstances, the individual should experience a precipitated withdrawal syndrome. This should decrease the likelihood of misuse and abuse of the combination tablet by the injection route. Those using diverted tablets who are physically dependent on illicit opioids (e.g., heroin). Parenteral use of the combination buprenorphine/naloxone tablet by these individuals would result in precipitated withdrawal more reliably than injection of buprenorphine alone. Those using diverted tablets who are taking therapeutic full agonist opioids (e.g., oxycodone, methadone). Parenteral use of the combination buprenorphine/naloxone tablet by these individuals also would result in a precipitated withdrawal syndrome more reliably than injection of buprenorphine alone. Those receiving prescription buprenorphine or buprenorphine/naloxone tablets who dissolve and inject their own medication. This population would experience an agonist effect from buprenorphine but no antagonist effect from naloxone, as large doses of opioid antagonists are needed to precipitate withdrawal in buprenorphine‐maintained subjects (Eissenberg et al. 1996). Although some of the agonist effects of buprenorphine may be attenuated by the simultaneous injection of naloxone, acute agonist effects will still be experienced whether the combination or the monotherapy product is injected. Those who abuse opioids but who are not physically dependent on them. In this group, neither naloxone nor buprenorphine will produce precipitated withdrawal. Sublingual or injected use of either buprenorphine product will produce opioid agonist effects; however, the euphoric effects would be mild. An understanding of both the general pharmacology of opioids and the specific pharmacological properties of buprenorphine is essential for physicians who intend to treat opioid addiction with buprenorphine. Buprenorphine has unique qualities that make it an effective and safe addition to the available pharmacological treatments for opioid addiction. The combination of buprenorphine with the opioid antagonist naloxone further increases its safety and decreases—but does not eliminate—the likelihood of diversion and misuse. It is important to understand that in vitro findings may not be predictive of what occurs in humans, underscoring the need for clinicians to monitor patients for potential drug interactions and associated adverse events. *Conceptual representation only, not to be used for dosing purposes.